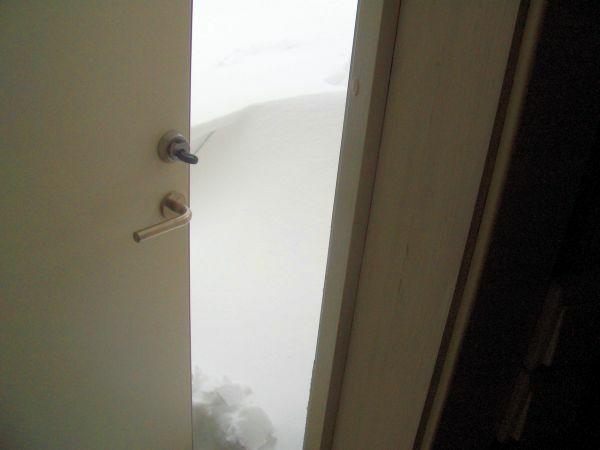 You know it is winter when you try to open the door and come face to face with a snowdrift almost as tall as yourself. OK, so perhaps I am not trapped in the classic movie scene style, in the howling blizzard and with a cute heroine. Wait, that is classic anime style. Anyway, not quite like that. Not even in the sense of not being able to get out the door, although I had to squeeze out sideways. I may even be able to leave the property, if my life depends on it, but not with dignity. The snow drifts are close to my own height, and the path I shoveled is utterly erased except near the house, where the walls keep the wind at bay. I started with the stairs in front of the door, and gradually cleared a small space so I could go in and out freely. I shoveled a path through the nearest snow drift to the small stretch of open road. I made a road in to the side of the house and excavated the heat pump, which was almost hidden in snow. And then I faced the open field, where snowdrifts stretched like dunes of the desert. I came less than half the way to the nearest cleared road, however, before I was exhausted and found it safest to go inside. I had already eaten before I went out to work on the snow, but I took a few glasses of Pepsi and water. (Don’t you think ordinary cola is too strong without watering it a bit? I use about 40% water, I’d estimate. So three or four glasses would be more like two glasses of pure cola. There will be a test on this topic.) I relaxed in front of the computer, and even napped a couple minutes. I felt fine when I went back out. Already some snow had accumulated during the couple hours or more, so I cleared that away first, then resumed the Herculean labor of extending the road. I had been out less than half an hour and cleared only a few feet of the huge snow drift, when I noticed that something was not working as expected. I was not breathing hard, but my heart was still laboring way too much. Now, there was no pain or anything like that, but it was out of proportion. Usually with that kind of heartbeat I should be winded. I was also weakening rapidly. Yes, this is what normals experience when they run out of blood sugar, I think. I have heard them tell about it, but it came as a bit of a surprise to me. I usually get tired in my muscles before I get that far. I don’t get to the point where I am lightheaded and weak etc. Or did not until now. I suppose that must be what happened, but who knows. If it is as I believe, then there is at least a silver lining: Until my glycogen reserves are rebuilt, I am going to transmute sucrose into that instead of fat. Of course, making fat even from sucrose is not very efficient in humans, but still. The liver is awesome (except as food, blech!). While I am relaxing, it is working full tilt, doing advanced organic chemistry for the whole body. I expect that when the morning comes, my muscles and the liver itself will be fully loaded with enough glycogen for another 24 hours of software support and playing The Sims 3. Of course, it is anybody’s guess how much snow shoveling that translates into. I hate looking like a heathen to my new neighbors, but I think I shall have to work on the Sunday. (It is not actually a holy day, you know, or rather not more than most days. But I don’t expect the local farmers to know that.) But that is for another day, and we don’t have that until we receive it, if ever.